I have a confession: I have a disdain for coconut water. This is complicated because I know it offers one of the most complete solutions for hydration, especially for distance runners. In fact, it’s been recommended to me by my doctor on multiple occasions as something superior to traditional sports drinks that are filled with unnatural ingredients that can cause more harm than good. 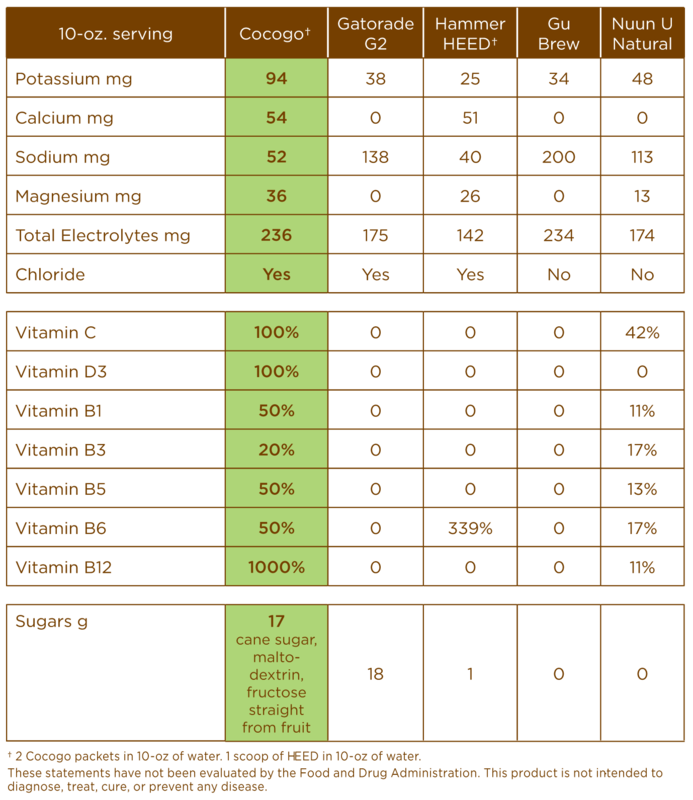 It’s even more complicated by the fact that I struggle with hydration issues and electrolyte imbalances in big ways. After most long runs (say 9 out of 10), no matter how much I hydrate during the run or what I do afterwards, I end up with debilitating headaches that require medication and in extreme cases, trips to urgent care or even the emergency room. I also struggle – like many runners – with stomach issues during long runs…usually starting around mile 8. I’m constantly on the lookout for a solution…which is why I’m really excited to introduce this next product! Yesterday I set out for my second to last long run before the Rock n’Roll Half Marathon in Washington, DC on March 15. It was a 14-miler, my first time over 13 miles since my last failed half. I was terrified…but, I had heard about a great product, Cocogo and I was hopeful. The product is marketed as a new premium sports drink made with real fruit (giving it great flavor!) and coconut water in a stick pack. It’s quickly becoming recognized for it’s great taste and performance enhancements. Cocogo has been credited with providing steady energy, eliminating muscle cramps and being easy to digest. I was intrigued. 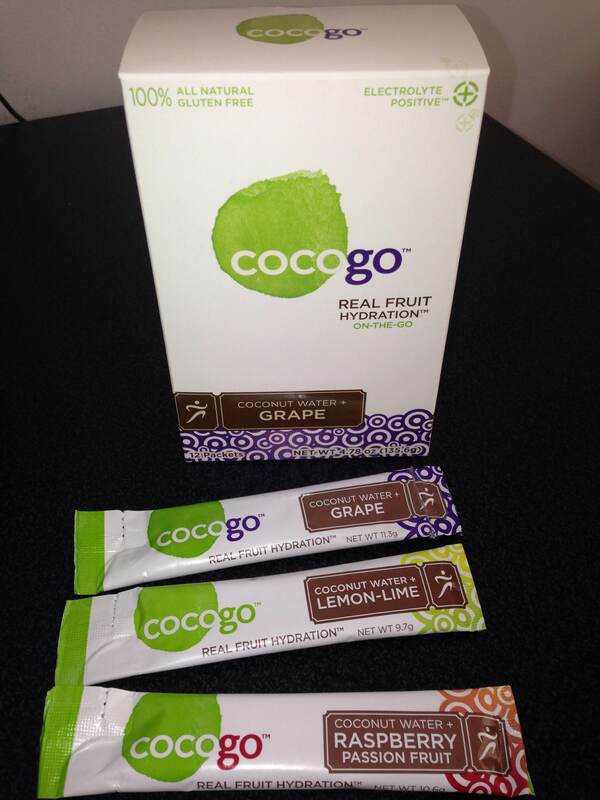 As per the package’s directions, I mixed 4 packets (recommended amount for intense flavor and extreme workouts, lesser amounts are needed for basic hydration needs) of Cocogo Grape with 14 ounces of water. I had my water bottle and set out. Every 20 minutes I took a swig of the drink…still unsure of what the result would be. Unlike stomach issues, my headaches don’t start until about an hour after I finish a run. I was pleasantly surprised! It was delicious. Plain and simple, I could not taste the coconut, just the grape (which is excellent for someone who has issues with coconut water!). It was sweet, but not overly sweet and was something I could enjoy whether working out or not. This gave it huge marks in my book. The claim that it’s easily digestible was absolutely confirmed. Generally even water hits my stomach wrong during runs. I had no cramps and no stomach issues…this was a huge plus! The real test came after my run, however. But, unlike any run of my past, I experienced no headache. To me, this meant a lot. The electrolytes did their job, and I was able to enjoy the rest of my day without any issues. To me, I can say, without hesitation, that Cocogo proved itself in big ways. This is my new drink of choice for top performance and I look forward to using it during my upcoming race in DC. If you’re looking for a complete sports hydration solution that does what it says it does, without the extra additives, this is your solution. Check out Cocogo’s website for more information. While my favorite flavor is grape, lemon-lime and raspberry passion fruit are also available and delicious. BEST NEWS EVER: I’ve officially become a Cocogo Ambassador. Use the code TAKETWOBLOG at check out to receive 40% off any order you place! Note: I was given packets of Cocogo to review for free, however, the opinions expressed above are my own and I do not promote a product unless I stand behind it 100%. Additionally, it’s important to discuss any major changes to a fitness regimen with a doctor to ensure overall health; what’s best for one person may not be for another. I’ve totally heard of this brand and now I’m anxious to try it. Thanks! !